Agathangelus Noury was born in France in 1598 and joined the Capuchin Friars in 1619. He worked as a missionary from the year 1629 until his death. As superior of the mission in Cairo he worked zealously to bring the Copts back to the unity of the Church. When he was sent as superior to the new mission in Ethiopia in 1637 he summoned Cassian Lopes-Netto to assist him. 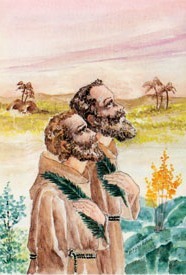 Cassian was born in Nantes in 1607 and made profession in the Capuchin Order in 1623. After a few months of missionary activity both were seized by the Abyssinians. As a reward for their apostolate both were crowned with martyrdom in the city of Gondar in the year 1638. They were beatified by Pius X on January 1, 1905.